Looking for a New Mercedes-Benz SL-Class in your area? CarGurus has 389 nationwide Mercedes-Benz SL-Class dealers with 597 new car listings. Mercedes is a brand with a rich history, one that has included different generations of the SL-Class since the 1950s. 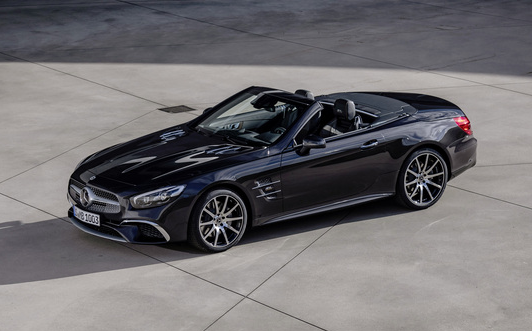 The current iteration was refreshed for 2017 and returns for 2019 with two significant changes: the AMG SL 65 has been dropped from the lineup and the Grand Edition has been introduced. Buyers can now choose from the SL 450, SL 550, and AMG SL 63. Positioned to compete with models such as the Jaguar F-Type and unmistakable Porsche 911, the SL-Class exhibits typical Mercedes-Benz style. Featuring a power-retractable hardtop, this 2-seat roadster appears more substantial and athletic than the smaller SLC and a bit more svelte than the larger S-Class cabriolet. Highlights include the prominent Mercedes emblem positioned front and center, sharply creased lines along the hood and flanks, fender vents, and an understated rear accentuated by dual exhaust tips. The Grand Edition of the 450 and 550 features a unique exterior color, Graphite Grey, along with a sport suspension, and a Tundra Brown Pearl leather interior with a leather-wrapped sport steering wheel. What’s under that hood depends on which SL trim you choose. The SL 450 includes a twin-turbocharged 3.0-liter 6-cylinder engine that delivers 362 horsepower and 369 pound-feet of torque. The SL 550 ups the ante with a 4.7-liter 8-cylinder engine that puts out 449 hp and 516 lb.-ft. In both cases, a 9-speed automatic transmission pushes power to the rear wheels. A 7-speed automatic comes standard on the AMG SL 63, as does a twin-turbocharged 5.5-liter 8-cylinder engine with 577 hp and 664 lb-ft. The 2019 SL 450 returns 20 mpg city, 28 highway, and 23 combined. The SL 550 cuts those estimates down to 17, 25, and 20, while the AMG SL 63 is expected to average 15, 23, 18. Being a Mercedes-Benz, the 2019 SL-Class arrives chock-full of amenities. Standard on every trim level are leather upholstery, heated front seats with memory and power headrests, navigation, and a glass-panel moonroof integrated in the retractable top. Other creature comforts include massaging and ventilated seats, genuine wood trim, and the Airscarf warmer system. Understanding that the cabin of a drop top can be a bit loud, Mercedes has equipped the 2019 SL-Class with a 600-watt surround sound system that should drown out other unwelcome noises. Should that prove to be insufficient, buyers can upgrade to a Bang & Olufsen audio package pumping out 1,000 watts. Apple CarPlay and Android Auto are standard on all trims of the SL. On the safety front, the 2019 SL offers a multitude of features, several of which can be found within the Driver Assistance package, which bundles pre-collision and lane-departure warning systems with a blind-spot monitor and adaptive cruise control. Crash test results are not available for the SL. Stylish and powerful, the 2019 Mercedes-Benz SL-Class is an ideal candidate for daily duty or a long overdue top-down road trip. What's your take on the 2019 Mercedes-Benz SL-Class? Have you driven a 2019 Mercedes-Benz SL-Class? Enter your zip to see incentives for a new SL-Class in your area. CarGurus has 2,958 nationwide SL-Class listings starting at $5,500.